Yves here. We regret the need to publish a detailed analysis of a pair of articles appearing in the current issue of The Nation. They are so fundamentally wrongheaded as to require retraction or a major rewrite, not just in their details but in their thesis: that small-scale mortgage vulture, Larry Schneider, is a hero for taking on JP Morgan Chase (Chase) over some mortgages that Chase forgave. Yes, you have that right. The Nation and its author, David Dayen, attack Chase for tearing up mortgages and try to depict a hedge fund manager as a saint for fighting the write-offs so he could milk more money from deeply distressed borrowers. Michael Olenick, the author of the article below, is an expert on mortgages who has done extensive work on foreclosure abuses. Olenick wrote The Nation twice, urging them to retract or do a fundamental rewrite of both pieces. The Nation did not at once respond. It instead forwarded Olenick’s email immediately to Dayen, whose response to Olenick arrived within hours. Olenick and we reviewed Dayen’s comments which in our opinion only strengthen the case for a retraction. The Nation may claim that “The point of the article is not that Larry Schneider is a hero,” just as Dayen may protest that “I don’t think of Larry Schneider as a saint.” However, the original articles are online. Anyone who reads them will immediately laugh at The Nation’s revisionist history and ask why they, in fact, depict Schneider as a hero. As for the core accusation that the Nation has decided to hang its hat on, namely that Chase defrauded the National Mortgage Settlement, Olenick eviscerates these allegations below. He shows that they rest only on Schneider’s word, when a Federal judge not only dismissed this case but also rejected 22 of of Schneider’s 23 claims with prejudice. All attorneys general who have reviewed these claims – the Obama and Trump Departments of Justice plus 21 state attorneys general – declined to intervene on Schneider’s behalf. Moreover, in many of the putative cases they are demonstrably impossible, and that even if something like this actually occurred, it was on a tiny scale, was probably rectified immediately, and has no public policy significance whatsoever. Even given the ample length of this article (get a cup of coffee! ), Olenick indicates that he has vastly more supporting evidence that he held back to keep the article to a digestible length. Outis Philalithopoulos was extensively involved in the verification and editing of Olenick’s article, among other things doing extensive fact-checking, a step The Nation seems to regard as elective. Finally, at the end of this post, we have embedded Olenick’s takedown-style treatment of Dayen’s articles, in which he dissects them paragraph by paragraph. While the main post shows how the errors in the articles are significant and that the entire framing is backwards as well as deeply unsuitable for a supposed progressive publication, the embedded document may for some readers give a clearer indication of how much is wrong with these stories. These articles represent the personal views of Michael Olenick and do not reflect those of INSEAD. The Nation, in its issue of October 23, 2017, announced a “Special Investigation: How America’s Biggest Bank Paid Its Fine for the 2008 Mortgage Crisis – with Phony Mortgages!” A complementary piece, “Behind JPMorgan Chase’s Bait-and-Switch,” ran the same day. Both articles were written by David Dayen. These stories are so fundamentally wrong that they require extensive revision or, more likely, retraction. Not only was I unable to verify a single new claim in the piece, and found numerous, significant errors, but the entire framing is a misrepresentation. Dayen presents “vulture debt” speculator Laurence Schneider as a Michael Lewis-style creative maverick who bravely takes on a corrupt banking behemoth, JPMorgan Chase (Chase). In fact, even a cursory look into court records will show that, contrary to the article’s wild assertions, Schneider is no benefactor of homeowners. Nor was Schneider substantively victimized by buying the small package of mortgages that is the sole focus of this story, as Dayen bizarrely and insistently claims. …. [Schneider’s] business model resembled what Roosevelt did in the 1930s with the Home Owners’ Loan Corporation, which prevented nearly 1 million foreclosures while turning a small profit. [His] model exemplified how the administrations of George W. Bush and Barack Obama could have handled the foreclosure crisis if they’d been more committed to helping Main Street than Wall Street. As even a modest investigation makes clear, this account is false. In reality, how could Bush and Obama have better handled the foreclosure crisis? They could have rewritten the bankruptcy code to force servicers to write down distressed first-lien mortgages to the fair value of the houses. They could have let banks and trusts fail by refusing to prop up reckless counterparty risk, and then purchased their mortgages for next to nothing in bankruptcy, refinancing at the lower principal amounts. They could have provided a real incentive for banks to write down or write-off loans. Selling loans to Larry Schneider, at a deep discount, is about the worst thing banks could have done for homeowners. It is difficult to overstate how wrongheaded these stories are. This is not an “ordinary guy vs. bad banker” tale: it is one banker, Schneider, fighting a bank, Chase. To bring public pressure to bear on an otherwise hopeless case, Schneider is trying to spin his interactions with Chase as somehow sinister, when, at the very most, his allegations boil down to a garden variety breach of contract claim. Big bank screws over vulture debt buyer? Since when? Schneider’s narrative, and The Nation’s stenographic amplification of it, would be bad enough if Chase and Schneider had treated homeowners equally poorly. But as detailed below, Schneider has in fact treated homeowners significantly worse. This core narrative – that Schneider is somehow noble – is arguably even more misleading than the myriad of factual errors and omissions in the piece. I had assumed that David Dayen was simply unaware of Schneider’s checkered business history, and that The Nation’s editors were on vacation when his stories were published. But actually, Dayen declared in his response to me (see below) that he knew full well that Schneider has been involved in “numerous” foreclosures that are “morally dubious,” but that he doesn’t “need people who uncover abuse and misconduct to be angels.” I am mystified at why Dayen then chose not to write a story about how the non-angelic Schneider had uncovered “misconduct,” but instead swept all of Schneider’s dubious behavior under the rug and thus wrote a very different story. After reading a preliminary version of this article, The Nation, while not saying much about the rest of Dayen’s articles, explicitly stood by his claim that Chase “received settlement credits for forgiving loans it no longer owned.” The Nation evidently assumes that this charge, at least, can be made to stick. However, the claim in question is once again based only on Schneider’s interested testimony. Schneider alleged that many of the loans in a big bundle he had been sold in 2009 were forgiven by Chase for settlement credit. A Federal judge pointed out that regardless of who owned the loans, they were forgiven a full two years before the National Mortgage Settlement even existed, and therefore Schneider’s theory could not possibly be correct; she dismissed virtually all the claims in Schneider’s lawsuit with prejudice. Many others who have considered Schneider’s claims have found them less than credible. Most recently the Department of Justice, which declined to join Schneider’s suit, stated that “[t]he United States […] does not take the position that Chase failed to comply with the terms agreed to in the National Mortgage Settlement” (see note  below). It’s hard to be much clearer than that. If any improper forgiveness occurred with loans not in Schneider’s big bundle, there is no reason to assume that it involved substantial amounts of money, no reason to assume that it was not rectified as soon as the matter was brought to Chase’s attention, and no reason to assume that it was used to claim settlement credits. In his response to me, Dayen jackknifes from the confident assertions in his published articles (“when [Chase] needed to provide customer relief under the settlements, [Chase] had paperwork created saying it still owned the loans”) to protesting that you can’t prove a negative (“there is no record of whether Chase still took credit for these inactive loans […] there really is no definitive answer”). There is extensive, readily accessible evidence that Schneider routinely buys severely discounted mortgages and forecloses on the affected homeowners, even in cases where he could easily modify their mortgages instead, while still making handsome profits. The Nation further alleges that Chase victimized homeowners by writing off their mortgages, which in fact is an action borrower advocates and homeowners regularly advocate. On the other hand, Schneider often vetoed or protested these writeoffs because he was holding out for a bigger payoff and could keep collecting from homeowners in the meantime. Dayen glorifies Schneider’s repeated failed lawsuits against Chase as “landmark,” “blockbuster” cases. This is a remarkable exaggeration. Dayen makes the false assertion that Chase’s forgiveness of these mortgages, a pro-homeowner action, violated the National Mortgage Settlement. He makes other ludicrous claims as to how the Settlement supposedly harmed homeowners which demonstrate a fundamental lack of understanding of how homeownership works. I do not like being put in the position of appearing to defend a malefactor like Chase, but I have seen again and again that the only hope of succeeding against powerful vested interests is to be accurate. False charges, particularly obviously false charges, serve as ready evidence that critics are uninformed and ready to go off half-cocked, and thus can be safely ignored. Dayen goes on erroneously to accuse Chase of foisting costs on homeowners for which they are in fact always responsible, such as the payment of property taxes. One has to wonder why The Nation has published not one but two articles which focus primarily on the complaints of a dubious hedge fund vulture – complaints about an insignificant commercial dispute, which have been repeatedly rejected in court. Schneider asserts that he is entitled to an unheard-of 1500 times (not 1500%, 1500 times) damages on a mere $200,000 investment in mortgages – mortgages, furthermore, that Schneider and Dayen acknowledge were described to Schneider as deeply defective. To put matters into perspective, Schneider made from a few Chase buybacks alone significantly more than he spent on the so-called “toxic waste” deal (see below for greater detail). He rejected Chase’s proposed buyback of 10 more mortgages that would have benefited homeowners and let him instantly realize additional gains equal to 50% of what he spent on the “toxic waste.” This evidence alone upends Dayen’s assertion that Schneider is benevolent and has only modest profit goals. None of the information I provide here was difficult for me to obtain, working as a single individual in my spare time from my living room with a $25 research budget. None of it is from controversial sources. All documents are from public records, and many were filed by Schneider himself. Even focusing only on the titular lawsuit, it is clear from just the docket entries that Dayen botched that part of the narrative. The Nation had the resources to verify its own reporting but simply neglected to do so. I am forced to add reluctantly that this is not the first time that Dayen has made substantial errors in his reporting on foreclosures. Lynn Szymoniak, one of the three focal characters in Dayen’s book Chain of Title, has stated in Figueroa v. Szymoniak et. al., Broward County Case No. CACE13006883 that “Author Dayen’s book is not a credible source for the court’s consideration.” Since I was working closely and actively with Szymoniak and the other protagonists in Dayen’s book, I can independently attest that there are significant errors in that work. I am prepared to discuss those as well. Below I describe the problems in The Nation’s reporting in greater detail (although not every error, since The Nation makes so many unsupported claims in this two articles that it would overburden most readers to discuss them all. I can provide more backup for each point above than I present in the balance of this document). I believe that any objective reader of the discussion below will conclude that a retraction is warranted. The Nation’s refusal to do so only reinforces my concerns about the breakdown in editorial quality control that has occurred here. After receiving the preliminary draft of this article, The Nation protested that “the point of the article is not that Larry Schneider is a hero.” Reading passages like these, however, it is clear that The Nation explicitly and enthusiastically praised Schneider and his business model. In reality, Schneider’s practices are starkly at odds with those normally supported by progressives. We know that Schneider bought distressed mortgages for a pittance. I show below that, despite paying pennies, Schneider has in many cases foreclosed on these mortgages, throwing borrowers out of their homes. This is not a secret: examples are easy to find. Indeed, Schneider himself complains in his lawsuits that Chase’s loan forgiveness had made it harder for him to foreclose on borrowers! In a 2013 case (Ruiz v. 1st Fidelity Loan Servicing, LLC), Schneider tried to foreclose with botched paperwork but the Minnesota Supreme Court ruled against him. This case is widely cited and has significantly strengthened the position of Minnesota homeowners contesting foreclosure. A. Examples in Dayen’s own story show Schneider harmed borrowers. Any informed reader of Dayen’s story would know that his homeowner anecdotes don’t fit his “Schneider hero/Chase villain” Procrustean bed. As a typical example of homeowners that Dayen depicts as “victims” of Chase’s “shell game,” he selects a family, the Warwicks, whose loan was improperly forgiven by Chase. Later, Chase bought back their loan from the mortgage holder and forgave it properly. As a result, the Warwicks got a house free and clear. This makes them victims how, exactly? According to the story, Chase bought back twelve similar mortgages and forgave them correctly – that’s twelve more homeowners helped by Chase, and in a very big way too. In November 2012, in fact, Chase offered to buy back all loans that had been incorrectly forgiven of which Schneider was aware, and to pay Schneider a 50-percent premium above what he paid. However, Schneider refused to sell some of the loans back. Schneider insisted that Chase tell at least some of the affected borrowers that the loan forgiveness was a mistake, and that those borrowers, including the Warwicks, should continue to pay Schneider. This allowed Schneider to continue collecting from the Warwicks, apparently for three entire years. Schneider purchased the $160,413 loan on Sept. 29, 2009, for $10,500. Chase eventually repaid Schneider the full $160,413. Someone here was working at cross purposes to the interests of borrowers, but it wasn’t Chase. Not only does Dayen’s own reporting contradict his central framing about who was the good versus the bad guy, but he failed to inform readers about what he himself knew about Schneider’s business practices: see below for Dayen’s statement to me that he was well aware of Schneider’s frequent foreclosures when writing the pieces. B. Dayen left readers in the dark about how Schneider regularly and ruthlessly forecloses on homeowners . According to The Nation, Schneider’s model of doing business involves “being flexible and dealing with homeowners directly” while “work[ing] out new repayment terms, allowing borrowers to stay in their homes.” The Nation thus depicts Schneider as modifying mortgages so that the terms become reasonable, and so making it so everyone can win. But in county after county, I found foreclosures from Schneider’s companies attempting to toss families from their homes. For instance, in Florida, there are Schneider victims in Palm Beach County, Broward, Miami-Dade, and Orange County at least. There are cases in Ohio, Indiana, Illinois, Minnesota. There’s one in New Jersey active as of February, this year. I kept finding foreclosures from Schneider companies in state after state until I gave up. There are so many, and they are so widespread, that it’s not feasible without significant resources to figure out how many mortgages he forecloses versus how many he modifies and on what terms. Dayen could have obtained actual evidence bearing on this point by asking Schneider for a list and then analyzing the resulting data. He did not. We can, however, look at particular cases. We have seen that Dayen interviewed the Warwicks, victims of Chase’s “shell game” who after all was said and done, ended up with a free house from Chase. Now let’s look at a second family, from Schneider’s county; their surname is redacted here for reasons of privacy. C. An example of Schneider’s business model: A mortgage buy resulting in Christmas eviction instead of a profitable modification. Willie and Edrica lived in Palm Beach Florida in a squat house with a mowed lawn – not a mansion, but nevertheless a home for their family. On April 13, 2007, Willie and Edrica took out a $140,000 mortgage from Chase Bank USA NA. They agreed to pay 7.125% over LIBOR, with the rate adjusted every six months subject to certain restrictions. Even by subprime standards this was a terrible deal. Chase sold Willie and Edrica’s mortgage to Schneider for $7,500, so for 5.4 cents on the dollar. It’s easy to see why The Nation is so impressed by Schneider’s business model – he then modified their mortgage, asking them to pay $900 a month. Consider Schneider’s generosity – he was only asking them to pay a mere 144% interest (not 44%) on his $,7500 investment (taking the $900 as the monthly P&I payment on a 30-year mortgage). Larry foreclosed on Willie and Edrica on Feb. 8, 2011, demanding $138,743.28. 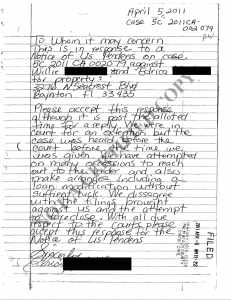 On Feb. 25, Willie and Edrica both filed handwritten letters letting the court know they were seeking an attorney and asking for time to respond to Larry’s foreclosure. Please accept this response although it is past the time allotted time for a reply. We were in court for an extension but the case was heard, before the time we given. We have attempted on many occasions to reach out to the lender and also make arranges including a loan modification without sufficient luck. We disagree with the filings brought against us and the attempt to foreclose. With all due respect to the courts please accept this response to the Notice of Lis Pendens. Willie filed his own handwritten notice the same day. In a county where contested foreclosures routinely take 2-3 years, and ten-year foreclosures are not uncommon, Willie and Edrica’s flew through the system like an aggressive cancer. On August 23, 2011, a Final Judgment was entered against Willie and Edrica for $178,829.56 (so for $40,000 more than was originally demanded). Willie responded with a typed motion and affidavit asking the court to reconsider, stating that he paid until he was no longer able, then was working on a modification, and in any case was never properly served. His motion was promptly denied. Six days later, judge Diana Lewis granted Schneider his eviction order. Willie, Edrica, and their two young children were to be evicted on or after December 28. There were other ways the story could have gone. Schneider could have written a 5-year mortgage for triple what he paid at 6% interest. The P&I payment on a 5-year $22,500 mortgage ($7500×3) at 6% would have been $435, just under half what Schneider was charging. Willie and Edrica and their kids would still be in their home, and Schneider would have tripled his original investment. He would have done well. But perhaps not as well as he actually made out. 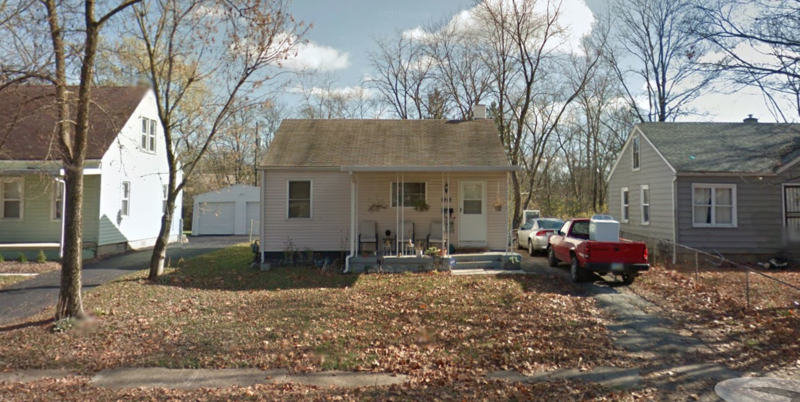 Three years after the Christmas eviction, after presumably renting the house to tenants, Schneider sold the house for $107,500. A respectable profit, considering the $,7500 he paid to Chase and the few thousand in fees he paid to foreclose (even without taking into account the amount Willie and Edrica and other tenants paid him in rent). Dayen claims that Chase committed fraud in order to fulfill its obligations under the National Mortgage Settlement of 2012 and he furthermore accuses Chase of harming homeowners and cities in the process. In fact, Chase was forgiving mortgages, which was not only permitted but encouraged by the National Mortgage Settlement. Dayen has to tell a “white is black” tale to depict a pro-homeowner action as somehow detrimental. A. Contra Dayen, Chase’s mortgage forgiveness program did not violate the National Mortgage Settlement. These claims by Dayen, once again, uncritically repeat allegations made by Schneider. In addition to Schneider’s preposterous $300 million lawsuit for damages on his mortgage purchase, he has also filed a whistleblower (qui tam) suit, alleging that Chase defrauded the federal and state governments in its efforts to meet the terms of the National Mortgage Settlement. The Nation neglects to inform the reader that, thus far, whenever disinterested parties have weighed in on Schneider’s lawsuits, they have been dismissive. In December 2016, a federal judge threw out his claims under the National Mortgage Settlement, and did so with prejudice (Schneider has appealed). In New York, courts have found three times that, even granting Schneider’s version of the facts, his case was hopeless, leading each time to Schneider amending his complaint and trying again. Already in January 2014, the Obama Department of Justice, invited to support Schneider’s case, declined; its decision has since been reiterated by all relevant state attorneys general and by the Trump Department of Justice. The Nation charges that “federal appointees” are actually “complicit.” We are to believe there is a conspiracy between the Department of Justice under both Obama and Trump, federal judges and magistrates, and every relevant state Attorney General, along with California’s much praised independent mortgage settlement monitor, Professor Katie Porter, as well as with Chase, and including CEO Jamie Dimon personally, all working together against Larry Schneider. Oh. Actually reading the cases – instead of listening to Schneider and his lawyers – shows that the courts and other relevant officials have determined that Schneider’s accusations are simply wrong. The only evidence that The Nation offers for the government’s supposed “complicity” is that “[e]-mails show that the Office of Mortgage Settlement Oversight […] gave Chase the green light to forgive its loans.” Once again, Dayen is complaining that borrowers had their loans forgiven (presumably instead of being foreclosed on). This is stunning as well as perverse. Dayen of all people should know that one of the major rationales for this part of the National Mortgage Settlement was to keep homeowners in their homes. Forgiving mortgages does that. What Chase did in this case was exactly what the National Mortgage Settlement was designed to do. Yet Dayen falsely depicts this as a bad outcome and an abuse. What is going on here? B. Contra Dayen, Chase’s mortgage forgiveness did not harm homeowners. The Nation claims that homeowners were “burned” and “exploited” by Chase’s “scam” in forgiving loans that it did not own. Generally homeowners are not hurt by having their loans forgiven – what, then, is The Nation asserting here? I would like to emphasize here that Dayen is claiming that forgiving mortgages is often bad for mortgage borrowers. Since this flies in the face of common sense, it would be interesting if Dayen were onto something here. However, this theory is nonsense. Would any reader object to their bank tearing up their mortgage, a 100 percent unconditional principal write-down? The answer is obvious enough – it sounds like a trick question but it’s not, except to Dayen. The responsibility for paying property tax and maintaining one’s house lies with the owner of the property. Whether the property is mortgaged, and whether the mortgage loan is forgiven, has nothing to do with it. If a family abandons a home, thinking it will lose it in foreclosure, and later the mortgage is unexpectedly forgiven, the family has two options. It can return home, paying property taxes and doing the necessary maintenance – it then gets what is essentially a free house. Or it can simply walk away, and then the municipality will take the property. In no case is the family worse off when its mortgage is forgiven. Once again, what does common sense tell us? Are people more likely to take care of a property if they own it outright or if they believe a lender will soon seize it? C. Contra Dayen, Chase’s mortgage forgiveness did not harm local governments.The Nation urges its readers to become indignant: “If you pay taxes in a municipality where Chase spun its trickery, you helped pick up the tab.” The tab for what? As a result of Chase’s “shell game,” “abandoned properties deteriorated further, spreading urban blight,” and costing cities money (difficulties ascertaining who owned the property, increased costs to maintain or demolish the buildings, increased police presence to maintain order in such areas). Does any of this make sense? It is large scale abandonment of houses that contributes to blight, not loan forgiveness, nor does forgiving mortgage debt encourage borrowers to abandon homes. Let’s consider a real example, a home in Columbus, Ohio. The owner did not pay their 2016 property tax of $595.14. Nor their delinquent tax of $8,013.11, penalty of $515.03, or back interest of $1,195.25. Finally, the city levied a six-month special assessment of $10,055.94 for maintenance. Since the owner did not pay the city, the mortgage holder could have made these payments instead in order to retain rights for the property, but declined to do so. The city tried to auction the property but, failing to find any bidders willing pay the full amount of taxes, took the property for itself on Oct. 6, 2017 (just a few weeks ago). The mortgage owner that declined to pay the property tax or the special assessment is Mortgage Resolution Servicing, Inc., a company owned by Larry Schneider. In a particularly bizarre part of the Phony Mortgages article, The Nation insinuates that Chase must have been up to something sinister by (1) investing $100 million in Detroit, (2) waiting until after the investment before forgiving loans in the Detroit area, (3) subsequently forgiving 10,229 liens in Wayne County. I have criticized Chase in the past, but for harming borrowers, not for forgiving their loans. More than on any other topic, The Nation spends its column inches trying to work its readership into a lather over how Chase treated Schneider; the Behind JPMorgan Chase’s Bait and Switch article is, in fact, almost exclusively devoted to this topic. Let us look at these accusations. Chase sold Schneider multiple bundles of loans. In the first, from 2003-2010, Chase sold Schneider bundles totaling 1003 loans with a face value of $54.1 million. He paid $6.4 million, averaging just under 12 cents on the dollar. The Nation doesn’t indicate Schneider had any problems with this set of loans; it concentrates its criticism on the other bulk deal. In that second batch of loans, Chase sold Schneider 3259 mortgages with a face value of $156.3 million for $200,000. That trade closed February 25, 2009. If Schneider is referring to both sets of loans, Schneider is demanding $300 million in legal damages on an investment of $6.6 million. But if the controversy is mostly over the second deal, then he wants $300 million on an investment of $200,000, more than the face value of this entire bundle of severely impaired loans. Surely, given this level of damages, Schneider must have been treated horribly. Let’s look. The Nation alleges that Schneider was tricked into believing that the $200,000 package of “toxic waste” was better quality than it turned out to be. Schneider was acquiring loans at 0.13 cents on the dollar, a little more than one thousandth of face value. He was buying them at the height of the worst financial crisis since the Depression. And we are supposed to believe that he thought he was receiving good quality mortgages? While The Nation waxes eloquent over the hardships Schneider experienced with this paltry $200,000 investment, Schneider’s subsequent actions were hardly those of a buyer who thought he had been cheated. He continued to buy mortgages from Chase for the next two years, and the amount he bought was larger than he had ever bought before, both in terms of price and face value. To give Schneider the benefit of the doubt, there is only one independently verifiable case in which Chase demonstrably screwed up in ways that affected Schneider’s interests: They released about 40 mortgages they had already sold to Schneider. But was Schneider actually harmed by this mistake? Recall that Schneider purchased the entire “toxic waste” package of 3259 loans for $200,000 plus another 1003 loans for an average of about 12-cents on the dollar. The Nation’s Special Report offers only specific criticisms of the “toxic waste” package. A casual reader would assume that the mistakenly forgiven loans were simply further evidence that something was wrong with the “toxic” package. In fact, this assumption would be wrong: At least some of the loans, including the Warwicks’ loan highlighted in the article, were not from this deal. In any case, Chase bought back the package of 13 loans for $105,375. The bank offered to buy back and forgive 10 more loans, including the Warwicks’ loan for $100,759; Schneider however refused, evidently assuming he could make more from those mortgages in borrower payments and foreclosures. Chase eventually agreed to buy back the Warwicks’ mortgage and another with similar characteristics for full face value, namely $428,053.61. Altogether, Chase paid Schneider $533,428 to buy back 15 loans. Summing up, for just 15 loans, Chase paid Schneider more than twice (267%) what he had paid for the entire “toxic waste” bundle which the Nation highlighted, while leaving Schneider in possession of at least 3244 of the original 3259 loans. If he had accepted their offer for the 10 additional loans forgiven in error, he would have realized 317% of the price of the “toxic” deal on which he was supposedly victimized, all the while still owning at least 3234 of the original loans. Words fail me. This is the abuse that The Nation considers worthy of a Special Report? If this is what The Nation considers victimization, I would like to be victimized, too. When The Nation states that “[t]elegraphing to executives that they will emerge unscathed after committing crimes not only invites further crimes; it makes another financial crisis more likely,” I absolutely agree. The way to raise awareness of the problem of financial crime is, however, to highlight instances of real wrongdoing, not to bill flimsy accusations largely dictated by a single source as groundbreaking exposés. Doing so trivializes and discredits efforts to illuminate the flaws in our financial system. The Nation owes its readers better. It is true that the National Mortgage Settlement allowed banks to take credit for modifying or forgiving mortgages that had been securitized and sold off to investors – a rule that richly deserved criticism, and in fact both Dayen and I criticized it at the time. Schneider/Dayen’s accusation in the Special Report is completely different: they do not criticize Chase (along with other banks) for taking advantage of technicalities in the NMS, but incorrectly allege that Chase committed outright fraud, forgiving mortgages with which it no longer had any legal relationship. Did The Nation run an expose based on lawsuits without pulling an official record of those lawsuits? Their story links to a partial docket, for one of the three cases, at a website called the “Fraud Investigation Bureau,” whatever that is. Why not link to the vastly more credible Court Listener, a free archive derived from the government’s official PACER court case repository? Or link to PACER itself, despite the paywall? When searching “1st Fidelity loan servicing” (1st Fidelity is one of Schneider’s three companies) – Google returns the Ruiz case first. It’s difficult to understand why this was entirely omitted from the story. Each adjustment period the loan could increase or decrease no more than 1.5% but could never be lower than 10.313% nor higher than 17.313%. The P&I for tripling his money on a 30-year mortgage – with, say, a ten-year balloon that assumed that they would be able to refi and Schneider would be able to cash in – would have been $134.90. In January 2014, Obama’s Justice Department declined to participate in Schneider’s whistleblower suit. The Nation wrote “…Schneider is also aiding the federal government in a related case against the bank.” No, he is not aiding the government because the Department of Justice, like Judge Collyer, does not believe that Chase committed fraud. Schneider has appealed his whistleblower case: there is an entire appellate case unmentioned by The Nation. In that case, the US government reiterated they do not believe Schneider’s core claim that Chase fraudulently took National Mortgage Settlement credits. Here is the relevant docket, including elections to decline intervention by the US and by over 20 states (every state that filed a notice declined to participate). The “blockbuster” racketeering case is on its fourth amended complaint: that means a judge has found three times that Schneider’s case makes no sense, even granting all of his statements of fact, and three times Schneider has modified his complaint and persisted. Here is the relevant docket. In fact, many of the loans that Schneider alleged had been forgiven in order to claim settlement credit under the NMS, including the RCV1 loans (the ones in the “toxic waste” bundle), were actually forgiven two years before the NMS even existed. In his response, Dayen does not claim otherwise – he there says “blighted properties” often arose because “banks delayed many years before foreclosing on these abandoned properties and failed to maintain them,” which has nothing to do with loan forgiveness and nothing to do with the specific accusations against Chase that are ostensibly the subject of the Special Report. In the four years leading up to the “toxic waste” deal, Schneider bought 530 loans from Chase for $2,185,227 (face value $16,446,709); in the two subsequent years, he bought 472 loans from Chase for $4,227,229 (face value $37,675,106). See here for a spreadsheet containing all of these loans. In his response to me, Dayen says that according to Schneider, he continued to buy loans from Chase “because he was trying to establish trust with another point of contact at the bank, so he could resolve the issue with the MLPA [Mortgage Loan Purchase Agreement],” and that Dayen regrets that The Nation’s editors cut this information from the final draft. This is ridiculous – Schneider bought $4 million worth of loans from Chase because he thought he had been cheated on a $200,000 deal? “at least,” here and above, because we do not know how many of the forgiven loans were actually from the “toxic waste” deal. This entry was posted in Banking industry, Guest Post, Legal, Media watch, Politics on November 2, 2017 by Yves Smith. Chase sold Willie and Edrica’s mortgage to Schneider for $7,500, so for 5.4 cents on the dollar. Pardon the stupid question, but why do the banks sell the mortgages for such a paltry sum? Why can’t/won’t they do their own modifications to get more than a one-time payout of 5.4 cents on the dollar? Why did not Chase offer to Willie and Edrica the opportunity to buy out the mortgage for 5.4 cents on the dollar??? You are blaming Chase for a foreclosure made by Schneider? Did you read the article with any care? The issue is that Dayen depicts Schneider as good guy who helped borrowers. He foreclosed on borrowers when he got the mortgages so cheaply that he could have modified them. Dayen is trying to make Schneider look virtuous, which is a pretty big job in the porcine maquillage department. The loans that were sold were non-performing. That meant that the borrower was not paying. If they couldn’t make mortgage payments, they could not come up even with $7,500. The big reason this is never done is that letting borrowers buy their own mortgages after they became close to worthless due to non-payment would provide incentives for mortgage borrowers to default en masse. The loan files were apparently a total mess and they were non-performing, meaning the borrowers weren’t paying. Chase got these loans via the acquisition of Bear and WaMu. They didn’t want even to board them onto their servicing system. More generally, as we have written, servicing agreements pay servicers to handle collection of funds, accounting, and payments to investors, which is a high-volume, very standardized activity. They also pay servicers to foreclose. The not pay them to modify loans. Modifying loans is high touch and takes a lot of work. So even though borrowers and the investors would come out ahead in many cases from modifications, the servicers aren’t paid to do then and therefore don’t have the apparatus in place. Now in fact they could have been forced to post crisis. The magnitude of the chain of title liability was so great that the mortgage-industial complex could have been brought to heel. But the Administration instead chose to give them a “get out of liability almost free” card in the form of the 2012 National Mortgage Settlement. If liberals” are going to substitute assumptions and their own biases for the hard work of digging and understanding what is really happening in finance and economics, it’s no wonder they keep losing. I think it cuts both ways: conservatives never concede that there’s a downside to the Laffner curve, a place where taxes and government revenue are out of equilibrium on the downside, where cutting taxes will decrease, not increase, government revenues. You do have a point that, for whatever reason, many finance and economic types do seem overall more conservative than the general population, though there are many exceptions on both sides. Look at the governments and economics of CA and NY compared to, say, Kansas or Arkansas. In any event I firm agree with you that the Kelo decision is a moral and legal disaster. Thanks for the Link. Very interesting case. Ouch. However, given my current readings Graeber, Mirowski, Harvey and the like, I tend to think that Liberal lawyers/judges, defined economically, would naturally support this decision given the economic system that is dominant or the version that is emergent. The needs of those with more capital (indicating their greater worth as capital creators) must perforce be greater than the needs of those with less or no capital. A liberal, it might be argued, must be open to interpretation and expansion of ideas – liberation from the norms and an expansive adoption of ideas that increase the wealth and wealth’s scope in society; especially when wealth is the dominant if not the only measure of worth. How that wealth is distributed must also be liberated from “artificial” constraints so that the most productive can further expand their individual potential in society and thereby lift/motivate the idle from their lethargy and mediocrity. I expect quite a few of these seemingly ideological contradictory decisions to become common and accepted from both sides of the doppleganger spectrum. It often appears that liberals wear a conservative mask to disguise their motives whilst conservatives espouse seemingly liberal agendas to free themselves from social regulation and break down the bonds of society that makes cultural constraint seem like unclean concept or, worse, an imposition on individual liberty. In a way, both liberal and conservative are often indistinguishable in an economic sense. Their motives are the same. Their means often appear different at times or the same at times, depending on circumstance and opportunity. Dayen doesn’t write that mortgage forgiveness is bad. I believe he is saying that Chase forgave loans it didn’t own, and then was credited by the gov’t as having forgiven those loans. This is bad for the homeowners because their mortgages aren’t really forgiven then, are they? Or am I interpreting this incorrectly/incompletely? You may not have read through the entire article. Do a search on The Nation’s “Special Report” page, and go to the paragraph containing the word “zombie.” Read the five paragraphs starting with that one – they cannot be made sense of without assuming that forgiving loans causes a whole series of problems for individuals and municipalities. He also says that Chase forgave loans it didn’t own in order to get credits from the government, a claim that Olenick discusses at length in the article. I just bookmarked this for a careful read, along with The Nation articles. I read David Dayen’s Chain of Title shortly after it came out and I took it at face value, and was shocked and impressed by it. I’m sorry to hear that there are factual problems with both that and Dayen’s recent work. I would appreciate hearing more about the issues with Chain of Title. I can’t believe there were any problems with Dayen’s Chain of Title, absolutely the best book written on MERS and the entire scam, including all the various breaking of laws, both regular and contractual and RE laws?! I’ve not read the book, but a cursory search of NC’s links to Dayen, and a search for bad journalism/reportage written by him conveys the impression of a good reporter with a solid grasp of the financial sector and the mortgage meltdown. So what’s sent him off the rails to publish a lengthy piece full of misinformation? He force fit the story into a Michael Lewis frame, little guys going up against big bad banks, when that is fundamentally misleading. Read my long comment below first. There were parties who were on to this before or in parallel with Dayen’s Florida trio, like Nick Wooten and Bubba Grimsley, and Tom Cox in Maine. The reason the people who were on to foreclosure fraud almost won was that this became a fight among the elites. And that was due to the communication and organizing done on Stoller’s listserv (in which the Florida crew were active but they were far from the only active parties) and Nick and Bubba ultimately getting the Congressional Oversight Panel and some state AGs interested. Olenick has read his book carefully. I haven’t because the many many omissions of people who did a tremendous amount of critical work is too disturbing to me. But even on a quick flip through I found a surprising number of technical errors. His publisher does not appear to have done much fact checking (the publisher of my book was relentless about it, and they actually did catch a few things not critical to the argument, but they still would have made me look bad had they gone in). And like many reporters, he is only as good as his sources and chose to focus only on his Florida protagonists, who were not expert in critical parts of the equation, even though they had gotten way down the curve on certain important parts of the foreclosure fraud story. Dayen himself is not an expert on mortgages or securitizations. You weren’t personally involved in this fight on a daily basis for two and a half years, as I was, and you aren’t expert in this topic, so with all due respect, you are in no position to judge. I was there live and I will confirm that Dayen’s book is rife with errors, including many technical errors and incorrect timelines. The reason this struggle got anywhere is that two Alabama attorneys that Dayen does not even mention, Nick Wooten and Bubba Grimsley, figured out the failure of mortgages to get into securitizations trusts. This was before Stoller set up the listserv, which was the critical vehicle for making this a political fight. I was one of two people who issued the invites for the meeting in Washington that officially kicked off this event and was one of the three administrators of the listserv. Bubba Grimsely, through me, got to Tom Adams, a career-long mortgage securitization expert, who at first thought Nick and Bubba were crazy but came to realize they were right. I started posting regularly on this as a result of Tom’s confirmation. Bubba enlisted all of the top experts in US on New York trusts, including most importantly, Georgetown law professor Adam Levitin, who was also Special Counsel to the Congressional Oversight Panel. Levitin’s validation was critical to the support important members of the elite, such as Levitin’s Harvard Law School classmate, Damon Silvers, who sat on the Congressional Oversight Panel, and Levitn’s longstanding colleague Elizabeth Warren. The COP validated the Nick/Bubba/Levitin thesis, which really drove this initiative forward. Silvers was an advisor to Eric Scheiderman, so that was the vector for getting Schneiderman as the attorney general who was most vocal about this issue and was the informal leader of the state attorneys general who were pushing with Levitin, Silvers, and others for a much more homeowner-friendly resolution that the Administration was pursuing. Do you see any of the three Florida protagonists as part of this account? No. Bubba and Nick both lost their marriages as a result of the time they spent on the foreclosure fight and trying to come up with ways not to fight it homeowner by homeowner (which was unwinnable) to come up with higher level legal issues as well as get political allies. And Tom Adams educated everyone on that listserv, including Dayen. The Florida crew would regularly go off half-cocked and Tom would have to sanity check and explain on daily basis, often multiple times a day. Adams also educated Levitin, Silvers, and some of the state AGs on securitization agreements and servicing operations. Bubba was also soliciting state attorneys general, a fact again totally missing form the book, and his efforts helped persuade some of them, undeniably Catherine Cortez Masto of Nevada. Dayen screwed Tom, Nick, and Bubba in his account and grossly underplayed the role that Levitin and Stoller performed. Olenick also did a great deal of analytical work that was important in persuading attorneys general and the press that Dayen omitted. He’s written them largely or entirely out of what he intended to be the official narrative of this story. This is not just my view. I had quite a few other people on the listserv tell me personally that they were upset with how Dayen airbrushed many critically important people who’d spent a huge amount of energy on this effort and made a real difference out of his book. The reason none of us made a stink is that Lisa Epstein, Lynn Syzmoniak, and Michael Redman did deserve to be recognized, and criticizing the book would diminish their ability to take pride in it. And mind you, Dayen directly benefitted from the work of the various people he chose to leave out. His journalistic accounts would have been shot down by banks and servicing experts if he hadn’t had the considerable help and tutoring of the experts on Stoller’s listserv. And even the Florida part, that Dayen covered in detail, is also full of errors. Olenick was seeing all of Dayen’s three protagonists close to daily. He not only knows them all very well, he saw what was happening real time. Olenick has sent me his notes on the book. He flagged over 150 errors and many are significant. For instance, Dayen says that Lisa Epstein lost her home to foreclosure. She didn’t. Her ex husband lost his home. There are other significant errors that would take longer to unpack. MERS is not a consequential piece of why the chain of title issue became a problem for the officialdom (except in Oregon, which has a state-wide recording statute). It was what Adam Levitin called “securitization fail” that got the officialdom freaked out. well this is disappointing, i had though mr. dayan had higher standards. Reminded of the Washington Post “meet” the reporters gatherings. Seems like The Nation is now doing mcarticleprvertisements. The trough trickles down? None of the entities who’ve been involved with the millions of unlawful foreclosures have been honorable, including many non-profits. Dayen, and The Nation, both appear to be registering high on the “bad faith-o-meter,” and that doesn’t help any of the folks that could use some help. > doesn’t help any of the folks that could use some help. You’re welcome: thanks for reading. Despite what they say, the bad reporting helps empower people like Larry Schneider. I’m reminded of both Icarus (played by David Dayen) and Capitalism, in this telling. Excellent work. Absolutely top notch. A superb example of the best American journalism. Kudos to all involved. Say maybe you can remind the homeowners that under the FDCRA, said homeowners are legally obligated to pay only the amount which the debt collector paid for the charged-off loan. Huh? Don’t make stuff up. It is against our written site Policies. A debt buyer is an assignee, and the amount paid for the debt is irrelevant; the assignee gets all of the assignor’s rights, including payment in full. Charge-off has ZERO legal effect on consumers. It is about whether a loan can be carried as an asset for bank capital requirements and nothing more. That was … quite a deconstruction, Michael, but the facts support it, and that makes it necessary. I’ve not ever known you to shy from the facts (that is among your admirable qualities). Thank you. I’ve been involved as a litigant for ten years. One thing I’ve learned is that when litigating against a bank a homeowner (either represented, or pro se) is allowed NO MISTAKES. Courts have usually predetermined the outcome of the case. In the best scenario the court may have to work a little harder to reverse engineer the proceedings to get to that outcome. Any mistakes just create an opening for the court to go Red Queen “Off with his head” that much quicker. I consider I have to be pure as the driven snow, try to do research to support my arguments accordingly, and know even that may not be enough. Shame on Mr. Dayen, considered by many to be a “shining light,” for just … making stuff up. Shame also on The Nation for running with it. Yes, sadly, courts are VERY biased against pro se litigants. Once in a great while a judge will cut the litigant some slack on their lack of familiarity with procedure, but even then, it is often class based. But generally, the attitude is “You are wasting my time, if you had a case, surely you could get someone to represent you,” which is ridiculous in foreclosures, when the attorney can’t get the bank to pay fees and someone who is facing foreclosure is by definition at the end of their financial rope. I try. Don’t know who you are but guessing you do too.